The third issue of The XTERRA Planet quarterly features a variety of athlete profiles and destination spotlights. 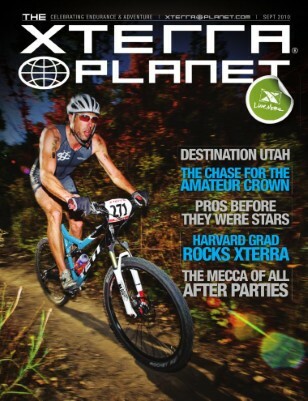 On the cover is age group all-star Jason Michalak on his way to winning last year’s XTERRA USA Championship in Utah. Michalak is back and faster than ever in 2010 and is on the verge of going pro. Inside this edition, we take a look at Jason and the super fast guys who are chasing him in pursuit of this year’s amateur crown. The September issue also shines the spotlight on visually-impaired racer Michael Stone, Harvard-grad Ashley Furst, and the very first Mrs. XTERRA, Susi Chandler. On the lighter side, we put together a “match the pros” photo ID game where readers can connect the pro with their childhood photos, and we take a look at the XTERRA Halloween Costume party in Maui. Plus, readers will see why Utah is quickly becoming one of America’s greatest endurance destinations, and get the inside scoop on the first-ever XTERRA Amazon off-road tri that took place in June.